In a moment, with your eyes still closed, you will begin seeing the image of Hello Kitty. You will feel calm, relaxed, peaceful and safe. You will hear the sounds of the magical register ding, have a sensation of wonder and awe of all the kawaii things around you, taking a deep breath as the luscious aroma of the store fill your entire senses, and listening to the bubbly chatter of obsessed Momoberry stalkers nearby. What are they happily gushing about? 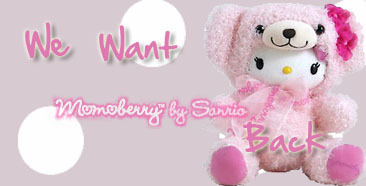 Why, it’s about Sanrio opening more Momoberry brand stores all over the world. Europe, London, and all way to Switzerland! No, no, keep your eyes closed. Yes, I know. You want to make *this* a reality by sending a love letter demanding the return of Momoberry to L.A.
Just pretend I never said anything. Just continue to relax and enjoy your visit to a Momoberry store until I tell you to open your eyes and wake up. Now, after having looked all over the exclusive merchandise of glittering jewelry, lovely accessories, elegant clothing, bodacious handbags, vibrant color cosmetics, sweet smelling beauty products, and colorful home decor— what’s keeping you there in your dream? … Why, it’s no wonder Momoberry’s infamous plushes have you so enamored. Oh, but, I’m sorry, your session is now over. We can continue this discussion on another day. Now, when I finished counting to 5, you may open your eyes.